This worked for me, there are absolutely no guarantees this will work for you. You need to ensure that he appropriate connector is pre-installed in your vehicle before spending any cash; even if the connector is pre-installed it may not be ‘live’. 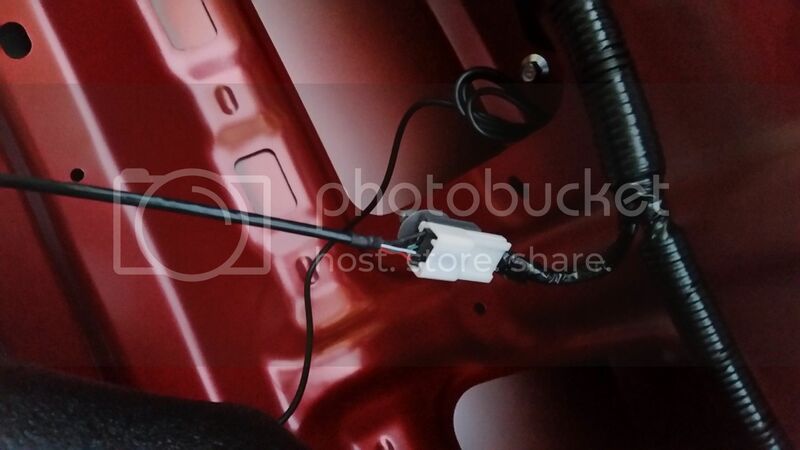 This installation process was undertaken on a late 2014 Mazda 3 Sport Nav Fastback (salon), I’ve no idea where the connector may be on the hatchback model, or if one exists (must be there somewhere). This should work as long as you have front and rear parking sensors, again no guarantees. I will not be responsible for any injury or harm caused to you, your vehicle, its electronics or its operation; neither will I be responsible for the quality of your workmanship. Be aware that if Mazda update the software at some stage in the future then the camera may stop working (unlikely, but I have to put this in here). Again, if you follow my installation you do so at your own risk. If after a successful working camera installation, you still manage to reverse into something, then it’s your fault! I hope that’s clear. Check required connector is installed. Remove enough trim clips from inside left of the boot lid, to enable the trim to fold back and give you enough room to work. There is no need to remove the internal boot lid trim completely. If connector is installed then it should be safe to order the parts, sit back and wait for postman. I used a AC/DC Multi Voltage Power Supply Adapter to supply 5 volts to the input side of the Step-up Voltage Converter, checked the output (with the multi-meter) and adjusted to 12v as required. Once this has been done, set aside. Take the USB PCB motherboard cable and trim back to the required length. Discard moulded USB plug (not required). Strip back cable, to expose the cable screen, black, green, white and red internal wires. Strip, wrap and solder the cable screen and internal black wire together. The white wire is not used. Solder the joined cable screen and black wires to the ‘In -‘ terminal on the step-up converter, solder the red wire to the ‘in +’ terminal on the step-up converter (see link from ebay above). Set aside. 3. Remove blanking plate from rear of Mazda 3 (only held in by pinch lugs). There is a lead that comes from the camera that has an inline connector, the second supplied cable plugs into this online connector, to power to the camera and a phono video out connector. 4. Drill a hole in blanking plate (or spare plate if you purchased one) and mount camera to the plate. 5. Shorten the second lead supplied with the camera, removing the phono plug and shortening the power leads. 6. Strip the red and black power leads for the camera and solder to the step-up converter, black to the ‘Out –‘ terminal and red to the ‘out +’ terminal. 7. Strip back the video cable, you are only interested in the internal yellow wire, make sure the other cables are insulated and not able to short circuit. Connect the yellow wire from the video cable to the green wire from the PCB motherboard cable from (2) above. 8. Make sure all connected cables are insulated to prevent a short circuit. 9. 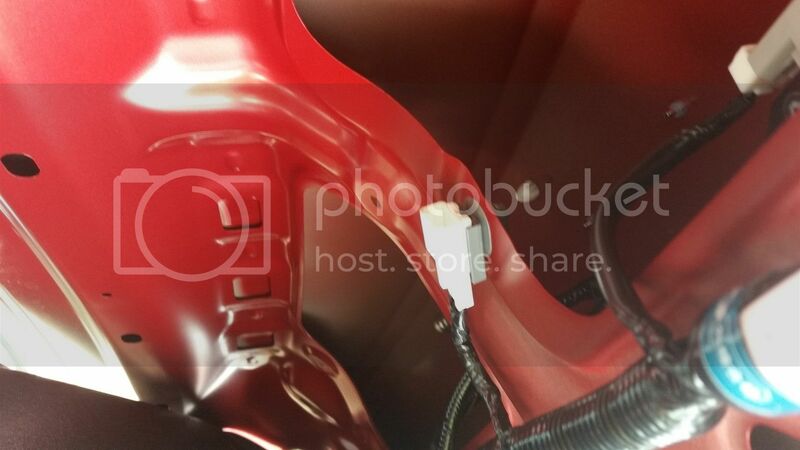 Assemble – mount blanking plate now holding camera back into boot lid. Plug PCB motherboard cable from 2 above into pre-installed connector. Tidy cables. I mounted the step-up converted in a small plastic tube and cabled tied everything together to the pre-existing wiring loom attached to the boot lid. 10. Test! – power the car (2 presses of the power button, no need to start the engine), wait until car is powered and the disclaimer message has been removed from the screen, press and hold return+nav+mute for about 10 seconds. This forces the infotainment centre to reboot, and it should pick up the camera. After the infotainment centre has rebooted and the disclaimer message has disappeared from the screen, you can put the car in reverse, if everything is ok then you should get the video image on your screen. 11. 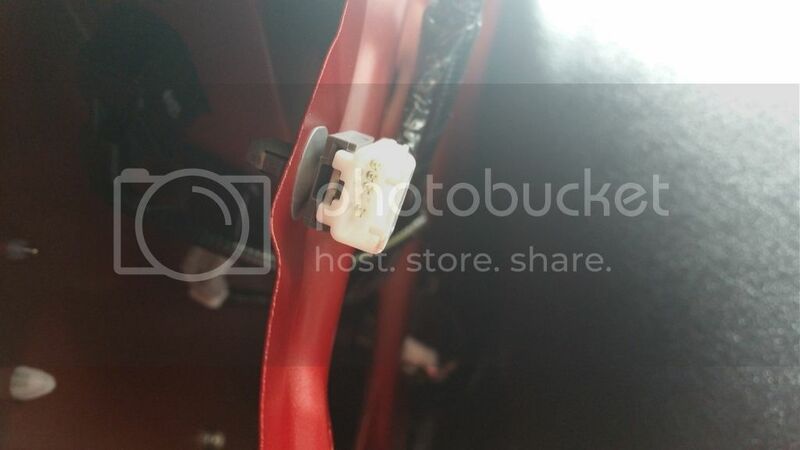 If all working, then re-attach internal trim to the boot lid and re-insert the trim clips. Excellent write up. Would other members please note the disclaimer.! ! Post stickied ! ! The new models now come with DAB radio too. Yup, since the New Year they come with the camera fitted. I had the accessory fit done just before Christmas and I can't recommend it more highly. Can't believe they ever cheaped out to not fit it. DAB radio would be nice, but I bet that's an expensive upgrade if even possible. Nvm, I've live happily with the Aha and FM. Seeing as you can now purchase the reverse camera a genuine accessory, I wonder what kind of job it is to fit? It's surely not a soldering iron job like this non genuine kind. Swampy.... Do you know? The reversing camera has always been available to purchase as a genuine accessory (there are photo’s of it on other sites and it has always been listed on mazda.co.uk), it should just be a case of popping out the current blanking plate, popping a bit of trim to find the socket (no idea where it might be on a hatchback, the supplied instructions with the camera should indicate where to find it) fitting the camera and reattaching the internal trim. I appreciate that there may be those who do not want to start purchasing parts, using soldering irons etc. the point of my post was to share information only. I’m lucky I have the skills, I could purchase the parts, and fitted the camera for £30, it has work perfectly since fitment. A saving for me of £218 over the current cost of a genuine accessory. Thanks. 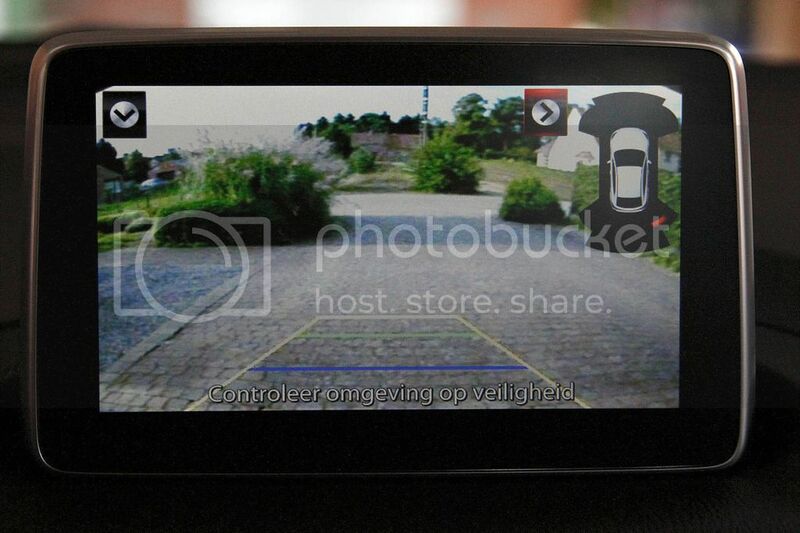 When I bought my Sport Nav 165 last summer, the salesman said you couldn't get a reverse camera at all. I believed him. Since then I've obviously seen and read of cameras.... Like here with your excellent write up of fitting one. Good skills! I was just curious about the genuine one that Swampy has had fitted as he is the first person I've heard of getting one. 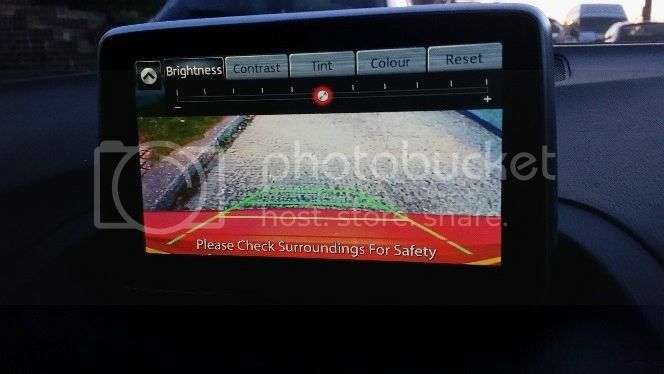 The genuine camera, I could never find listed on the UK Mazda accessories site, it's recently appeared. Along with the DAB adapter, which incidentally is about £188. Sorry, I can't say how easy an install it was as I didn't see them do it, just dropped the car off - but I'd be absolutely shocked if it's anything more than a straight connector fitting in to the same line than gknight9 ended up plugging in to. The reversing camera was available when I got mine but I had to argue blue in the face to get the dealer to commit to it being properly integrated with the same line-overlay & sensor display as the factory fitted one as the engineer was convinced he'd fitted one and it wasn't... but in the end it is every bit as integrated. Oh 9swampy – that sounds shocking. I’d be going bonkers if that was the case on my car. I’m sure the photo’s and descriptions I have seen on line of the genuine accessory, show the camera pre-fitted to a new plate. It should really just be a case of popping the existing blanking plate, feeding the cable through and clipping in the new plate with camera attached to the car, connect up the lead to the pre-installed connector and away you go. The overlays come from the camera, just get the right camera and you get the overlays. If it was a genuine accessory, then I’m not sure why your dealer seemed to struggle so much. The reason for the step-up converter and use of a soldering iron, is that the pre-installed connector only supplies a +6v supply (why??). 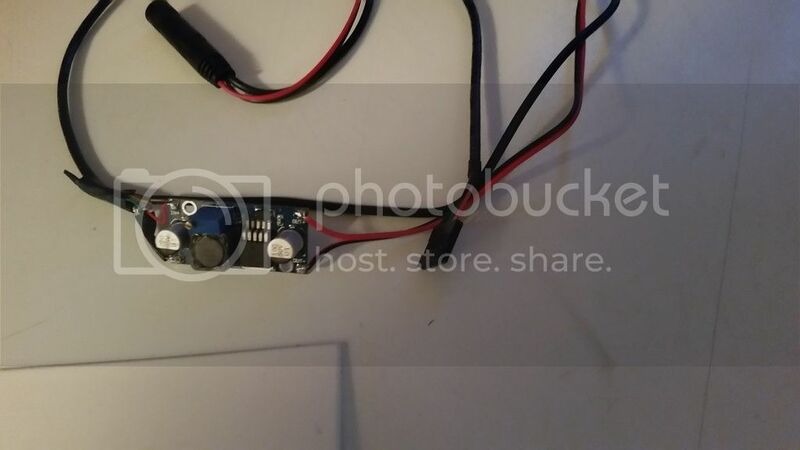 The camera that I purchased really needs 12v, so used a step-up converter and set it at 12v. Has anyone tried this on a UK 2014 hatchback? I can't see a connector under the trim near the rear reverse light so I'm guessing it's behind the license plate area. However I'm not really sure how to remove this trim - it seems very firmly attached compared to the top piece. I find it odd how some instructions on the internet seem to require fitting a custom cable to to the display end for the video feed. Perhaps US models are different? 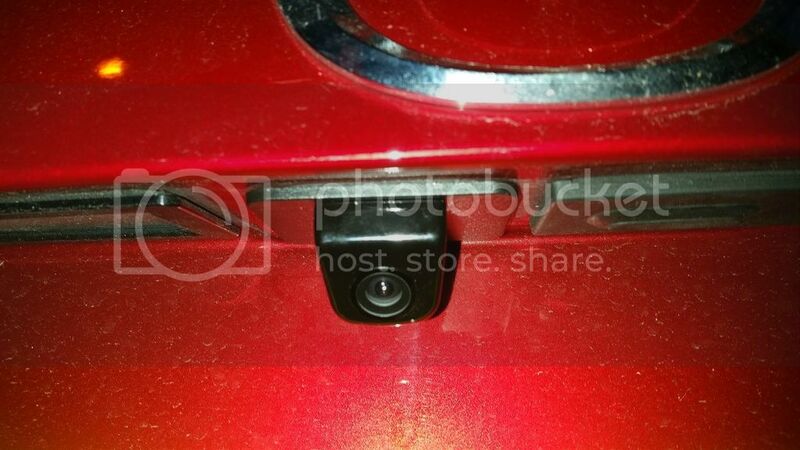 Has anyone managed to fit a reverse camera to the hatchback model? I can't spot the required connector for the camera. If anyone can say for certain that it's there - I'll take another look perhaps. Yes, I have just installed one on a 2015 UK hatchback, using the components listed by the OP (but not the USB cable or blanking plate). 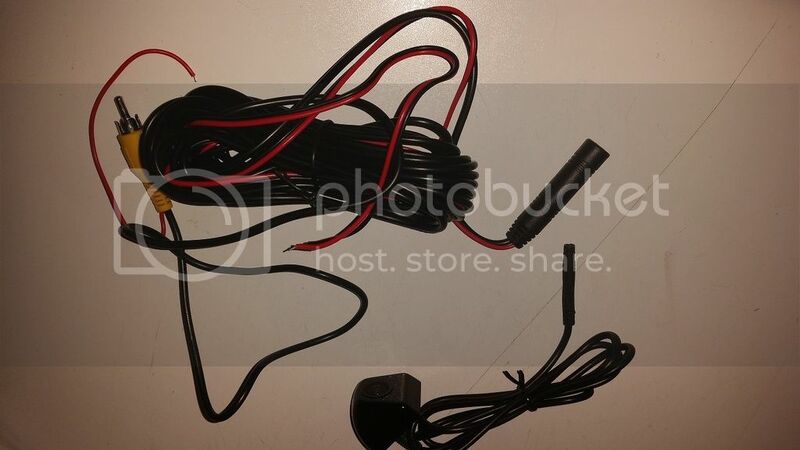 The car's power and video cables are there, but on mine they didn't terminate in a socket behind the license plate. I found they only went as far as the large C-16 connector where the cables enter the top of the tailgate near the top break light. Dark grey - 6v ground (also connect to 12v convertor as described). Don't confuse dark grey with black - very similar. The camera is retained by a back nut and I was able to access it for tightening by undoing six nuts behind the lower trim that hold the license plate lights trim, also undoing the fastenings adjacent to the camera position from the outside. That's really useful! Many thanks for your reply. I had purchased all the bits but didn't want to proceed much further. Out of interest, how did you actually find out about the camera cables and colours etc? I did bit of searching and found another forum where somebody had found the correct wires.